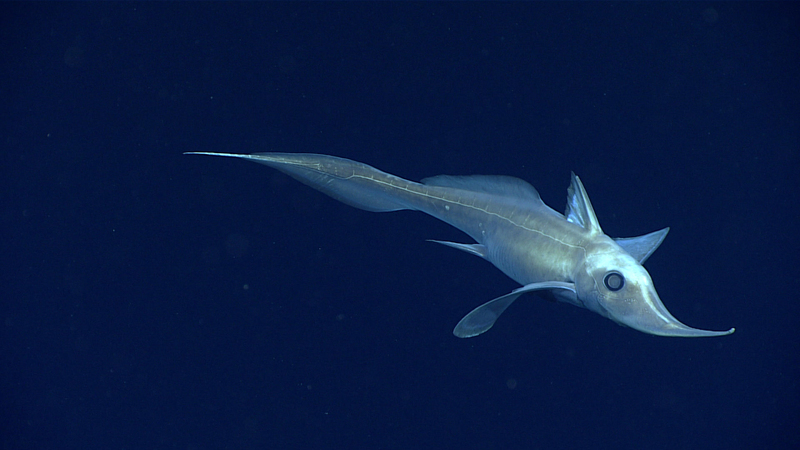 Hariotta raleighana, a long-nosed chimaera, dropped by during the dive. This was the first time many on board has seen one! Image courtesy of the NOAA Office of Ocean Exploration and Research, Gulf of Mexico 2017. Download larger version (jpg, 558 KB). Bathymodiolus mussel beds are home to a huge variety of invertebrates, including ophiuroids, scaleworms, and limpets. Image courtesy of the NOAA Office of Ocean Exploration and Research, Gulf of Mexico 2017. Download larger version (jpg, 1.3 MB). Neolithodes agassizii, a major predator at Gulf of Mexico cold seeps, is observed chowing down on a Bathymodiolus brooksi mussel. Image courtesy of the NOAA Office of Ocean Exploration and Research, Gulf of Mexico 2017. Download larger version (jpg, 1.7 MB). During the tenth dive of the expedition, we found this brine pool, which is essentially an underwater lake. The salinity of the water in pools such as these can be three to eight times more than surrounding water, meaning the brine water is much denser and thus sinks, forming a pool. Video courtesy of the NOAA Office of Ocean Exploration and Research, Gulf of Mexico 2017. Download larger version (mp4, 46.0 MB). 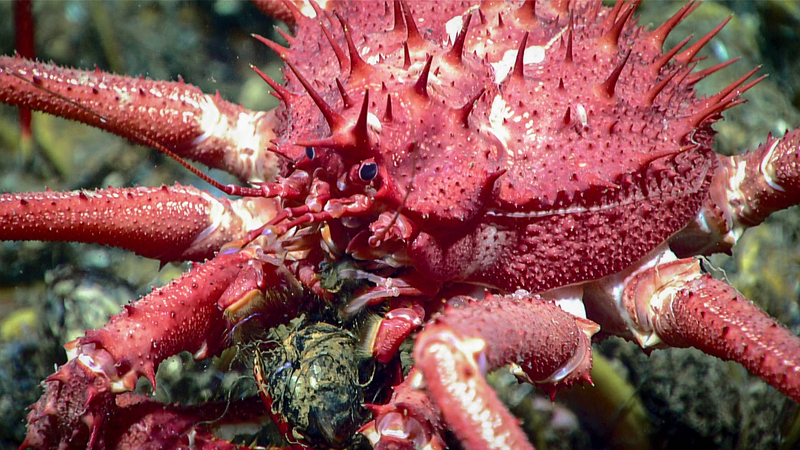 During Dive 10, we explored a series of seep targets identified during multibeam surveys by NOAA Ship Okeanos Explorer near a proposed Flower Garden Banks National Marine Sanctuary expansion zone and a proposed Habitat Area of Particular Concern. In the vicinity of the first seep target, we discovered a brine pool fringed by chemosynthetic mussels (Bathymodiolus brooksi). Within the pool, the shells of mussels, that appeared to have drowned when the brine level rose, were visible. Bacterial mats, king crabs, several species of tubeworms, squat lobsters, shrimp, and amphipods were also observed near the brine pool. Nearby, we discovered two additional areas of seepage surrounded by mussel beds and other associated fauna, including one that was quite extensive. 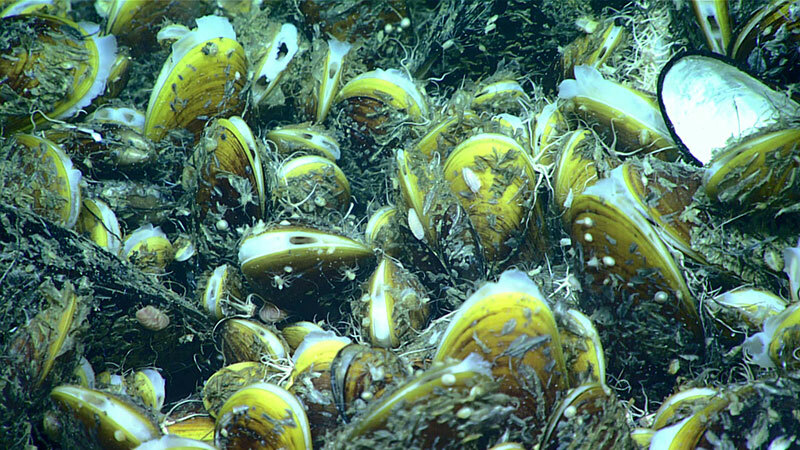 The Bathymodiolus mussels varied in size, indicating multiple recruitment events. Under a neighbouring overhang of authigenic carbonate covered with Actinernus anemones, methane hydrate was spotted accumulating. To enable exploration of the second bubble target on the other local high in the area, Deep Discoverer transited quickly over a sedimented plain, where we observed a range of species, including sparse Bathymodiolus brooksi shells, tube-dwelling anemones, several Umbellula sp. sea pens with commensal mysid shrimp, sea cucumbers, and sea urchins. Approaching the second bubble stream, patches of reduced sediments and bacterial mats were seen in increasing frequency. A community of tubeworms, squat lobsters, and shrimp was observed on an outcrop of authigenic carbonate. In this area, Actinernus anemones were also abundant. Throughout the dive, a wide range of fish were observed including two species that had never been seen before!